Android powered Acer Stream dubbed as "the Perfect Entertainment Machine"
Just when North America was just about ready to witness all of the fun surrounding the Acer Liquid e being released with Canadian wireless carrier Rogers, Acer decided to let out one of its high-end offerings from right under its feet. Acer is jumping straight to the top with their latest Android offering in the form of the Acer Stream which is being positioned as “the perfect entertainment machine” that won't disappoint people out there with its impressive listing of specs. 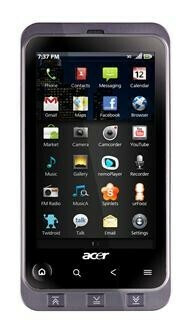 Similar to some of the devices towards the upper echelon of the Android group, the Acer Stream features the always snappy 1GHz Snapdragon processor, 3.7” WVGA touchscreen, 5-megapixel camera, 720p video recording, HDMI out, 512MB RAM, Bluetooth 2.1, Wi-Fi, GPS, 8GB microSD card, 2GB internal storage, and 7.2Mbps HSDPA. As you can tell, it'll naturally cater to the needs of individuals focusing heavily on its multimedia aspects – which shouldn't pose to be a problem with this powerful handset. Now the only thing left out of the mix to complete its experience is Android 2.2 Froyo, but it'll opt to pack on Android 2.1 from the start – but we'd imagine that it would also see an update down the road. This phone caught my eye from the Google I/O and finally I get some information to this phone. So excited~! I previously hated the Acer Liquid line very much but this phone may alter my way of looking at "Liquid" line again! Augh I would give to have this, looked really nice. Looks much like a toy than a phone but it's still pretty cool. The GUI was pretty nice as well. curious as to what makes this The perfect entertainment Machine more than any other android device. Especially the N-1 with flash 10 and froyo.